Our mid-October 2009 visit was perfectly timed for the brilliant yellow fall leaves, brilliant sun, and ideal temperatures – up to 70˚ during the day, and a refreshing 45˚-50˚ at night. 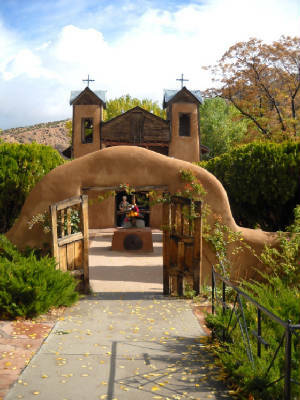 Less than a week in Santa Fe hardly makes us experts, but this is what we learned. I-25 is the fastest road from Albuquerque, but the 52-mile-long Turquoise Trail National Scenic Byway is more scenic. The obvious place to stop is Madrid. From Albuquerque, Exit I-40 at Tijeras and head north on NM 14. Get back on I-25 for a brief time, heading northeast (rather than proceeding north on Cerrillos) and exit north on St. Francis (84/285) for a quicker, less sprawled, entry into Santa Fe. We stayed at the Hotel Santa Fe and highly recommend it. Native American owned and operated with a quiet, comfortable atmosphere. A few minutes from the Plaza, but the hotel offers a free, on-request shuttle for guests, not only to the Plaza but around town. Call the hotel, and the shuttle will bring you back to the hotel or to another destination. Restaurants. Reservations necessary for all. The Shed. Casual Southwestern; in the Plaza. The bar is comfortable and serves the same food as the dining room, if it’s hard to get a table. Café Pasqual’s. Southwestern with French influences; in the Plaza. Also said to be fantastic for breakfast. Ristra. Quiet; in neighborhood of Hotel Santa Fe. Limited menu, beautifully executed. Southwestern and French. Easy parking. Tecolote Café. Terrific local breakfast place; in neighborhood of Hotel Santa Fe. Easy parking. Don’t miss the piñon pancakes. To Do in Santa Fe. The Plaza, of course, whose special history and atmosphere extends a few blocks in every direction out from the center. Not all of the museums are in the Plaza. Museum Hill is an easy driving destination, with a group of four major museums. 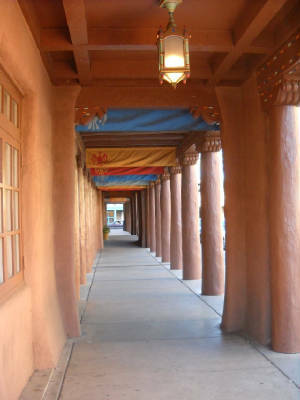 Museum of International Folk Art; Museum of Spanish Colonial Art; Museum of Indian Arts & Culture; and Wheelwright Museum of the American Indian. Go to The Georgia O’Keefe Museum to learn about her life and for special exhibitions. The small survey on permanent display will leave you wanting to seek out her other major works that are in other museums around the country. Parking is on city streets. The commercial art galleries are grouped on Canyon Road. A short drive from the Plaza; 100 galleries are reachable on a walk of only a few compact blocks. We recommend researching the offerings before you arrive to save time. One way is to order The Collector’s Guide to the Art of New Mexico, published once a year in April, with over 700 images. This is free in Santa Fe, but we came across it late in our visit. Much information also is available on the website. San Miguel Chapel. Adobe structure dating from 1610. Oldest religious building in US; one of the oldest in the Americas. A short walk from Canyon Road. To Do Outside of Santa Fe. Shidoni Foundry. 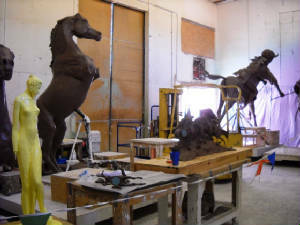 The short, lovely ride up Bishop’s Lodge Road alone makes this visit worthwhile, but Shidoni’s foundry, galleries, and sculpture gardens are among Santa Fe’s greatest pleasures. Try to time your visit from noon-1:00 pm, so that you can walk through the foundry itself during lunch break. Before you go, crawl through the website’s listing of the talented artists and items that are on display and for sale. Sanctuario de Chimayó The sanctuario is a major pilgrimage site, and one of those physical places around the world, like Delphi, with an unusual spiritual atmosphere. Take the High Road to Taos to get there. A beautiful, isolated drive. Take U.S.285/84 north from Santa Fe and turn east on N.M.503. The byway turns north on N.M. 520, traveling through Chimayó. 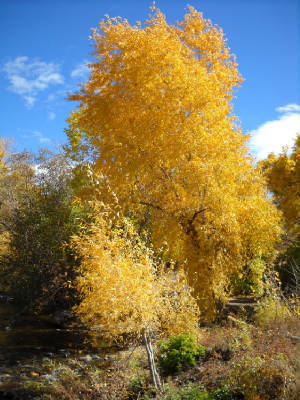 Taos. The ride from Santa Fe to Taos, whether on High Road to Taos or alongside the Rio Grande gorge, is unforgettable. 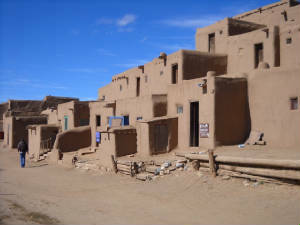 The Taos Pueblo is a living community, with a handful of families still living there. The buildings offer no physical challenges to visit; while very old, these are not cliff dwellings. A world heritage site. We enjoyed the Harwood Museum of Art very much, particularly its Hispanic Traditions Gallery, with its collections of Santos, and its Brandenburg Gallery of Early 20th Century Art, with its holdings from the Taos Society of Artists. As you can tell from this short list, there is much we did not have time to do in the area. With any luck, more visits to come!